Cafés and Paris go together like coffee and croissants, or like absinthe and insanity. And while it's true that France's café population has dropped from more than 200,000 in 1960 to 41,500 today, the café-bar is still very much a part of Parisian life and lore--and it's an indispensable neighborhood destination on any trip to Paris. 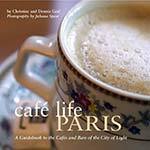 In Café Life Paris, Christine and Dennis Graf (co-authors of Paris by Bistro) describe "a handpicked selection of the best, most historic, and most idiosyncratic Parisian cafés." Each café profile has a page or two of text (sometimes more), and most descriptions are accompanied by appealing color or black-and-white photos by Juliana Spear, who also did the photography for another Interlink Publishing book, Romantic Paris. "Great and Glamorous Places" describes the most elite and expensive cafés in Paris, such as La Coupole, Fouquet's, and Café de la Paix. "Legends of Literary and Art" profiles Les Deux Magots, Café de Flore, and other historic cafés where the likes of Hemingway, Picasso, and Simone de Beauvoir have been replaced by a newer and more prosperous generation of authors, painters, academics, and tourists. "Neighborhood Cafés" draws on the authors' 30 years of experience in Parisian café-hopping, with a tasty assortment of cafés and bars on the Left and Right Banks. "Cafés by Design" focuses on interiors, profiling unique locations such as the Atelier Renault (a starkly modern café above Renault's design showroom on the Champs-Élysées) and the Bricolo Café, a recreated old-fashioned workshop next to the BHV department store's hardware department. "Nineteenth-Century Look" is just what the name implies, while "A Gathering of the Young" describes cafés that are frequented by hip Parisians under 30. "Cafés Plus" profiles establishments that "defy the normal definition and go beyond what a café is normally expected to be," such as places that feature poetry readings, live music, or even dancing. Finally, "Tourist Cafés" will help you find the most agreeable cafés (ideally with sidewalk tables and scenic views) near the city's leading monuments and tourist meccas. Café Life Paris is a delightful guidebook, souvenir, or gift book for anyone who loves Paris. For short excerpts from Café Life Paris, please see the next two pages. You can purchase the book at bookstores, from online booksellers, or directly from the publisher's Café Life Paris Web page.